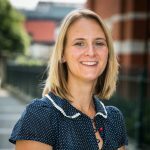 Dr Katie Laird is a Senior Lecturer in Microbiology in the School of Pharmacy, De Montfort University. She has a BSc (Hons) in Biology and obtained a PhD in applied microbiology in 2008. She is currently Head of the Infectious Disease Research group at DMU, and has a team of seven researchers working on various projects. During her PhD she developed and patented an essential oil-based antimicrobial vapour. Dr Laird’s research is centred on the prevention of transmission of Healthcare Acquired Infections (HAIs) particularly on textiles and the development of novel antimicrobials as alternatives to current disinfectants and antibiotics. Katie also has two young children and appreciates the importance of children learning about health and hygiene from a young age, thus A Germ’s Journey was created.